If you’re looking for a wide variety of things to do this weekend, look no further than the borders of yon fair Cardiff. We’ve got Christmas markets! We’ve got techno! We’ve got plays! We’ve got literary events! We’ve got a Christmas cabaret! We’ve got grime! So, that’s basically saying there’s a lot on this weekend. Have a great one, wherever you end up! Get over to the Boiler House for the long awaited re-launch of the new The Boiler House Graffiti Project space! The crew have been toiling away for months preparing the space, and this event is a chance to come and see the freshest event space in Cardiff, enjoy some good beers, listen to good music and hang out with great people. The Boiler House is a not-for-profit community interest project. They host pop-up events and graffiti workshops for all ages. 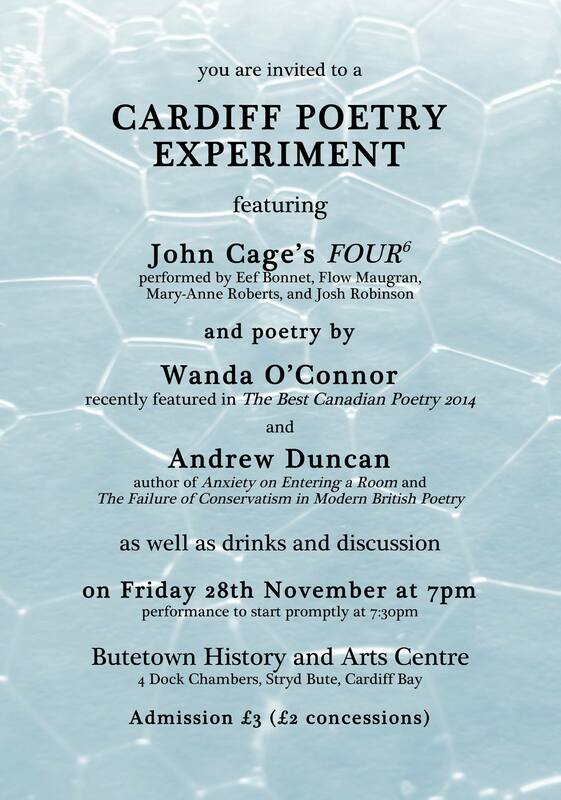 Join Cardiff-based writers and artists on Nov. 28 at 7 pm at the Butetown History and Arts Centre for an evening of experimental poetry with readings from Wanda O’Connor and Andrew Duncan plus a performance of an avant-garde piece from composer-theorist-writer John Cage. Did you miss the massive literary / arts / music-fest that was PYRAMID SCHEME 1? Well, lucky for you, they’re doing another one! PYRAMID SCHEME II – IT’S BACK // AND THIS TIME IT’S INDIFFERENT. NEW VENUE // SAME CHILL VIBE. JOAO MORAIS // Winner of the 2013 Terry Hetherington Award for Young Writers. Oh my days. This is one for the raving crew! If you’re after a night of sick grime’n’bass, get to Buffalo late Friday night. If you prefer your beats to be 4/4 in nature and hard enough to drill through concrete, head to Clwb Ifor Bach for some pounding techno courtesy of long-standing Cardiff techno night, Holodeck. Okay, they may have had a bit of a hiatus, but they’re back, baby! On Saturday November 29th, in conjuction with Somewhereto_, ProMoCymru, and The Modern Alchemists, ON iiiT brings you The Cardiff Christmas Bazaar! A broad mix of Christmas market stalls full or art, crafts, gifts, cards, face painting, creative workshops and performances, this festival in a day is the ideal way to spend a Saturday, whether it’s for Christmas shopping or just a fun day out. The Abacus, a fantastic space situated in the heart of Cardiff, less than 5 minutes from central station. This not-for-profit fundraising market is raising money for Y Care International ICS, giving young people skills, hands on experience and the opportunity to progress in life. Expect an array of arts, crafts, delights, gifts, workshops and performances. The perfect place to get presents and inspiration. Bringing together members of the general public and people who have mental health problems with the aim of producing art exploring creative avenues. If you’re after a day of spiritual wellness, get to the Temple of Peace on Sunday for an inspiring day of yoga, raising the vibration for peace on our beautiful planet. The day will consist of the following sessions: a balancing combination of yin and yang yoga, meditation and a blissful sound bath. Chapter MovieMaker is a monthly event where we screen and chat about short films with the people who made them. Admission is free, but tickets still need to be collected from the box office at Chapter, and it’s often best to reserve/collect them early (Cinema 2 only has 57 seats). That’s all for this week. Have a grand weekend all! ← Celebrate the festive season with Mary Bijou’s Nut Cracking Christmas!